Ampersand Mountain offers a grand view of the Saranac Lakes. Jessica Seem brought her two sons to the Adirondacks for vacation this summer after reading on the Internet about the Saranac Lake 6er challenge. They drove 260 miles from central Massachusetts and spent the next several days climbing six smallish mountains near the village of Saranac Lake. Thanks to a tourism initiative begun by the village in May (of 2013), hikers who climb all six peaks earn a patch and the right to ring the 6er bell at downtown’s Berkeley Green. The peaks range in height from 2,452 feet (Baker Mountain) to 3,322 feet (McKenzie Mountain). In between are Haystack, Scarface, St. Regis, and Ampersand mountains. 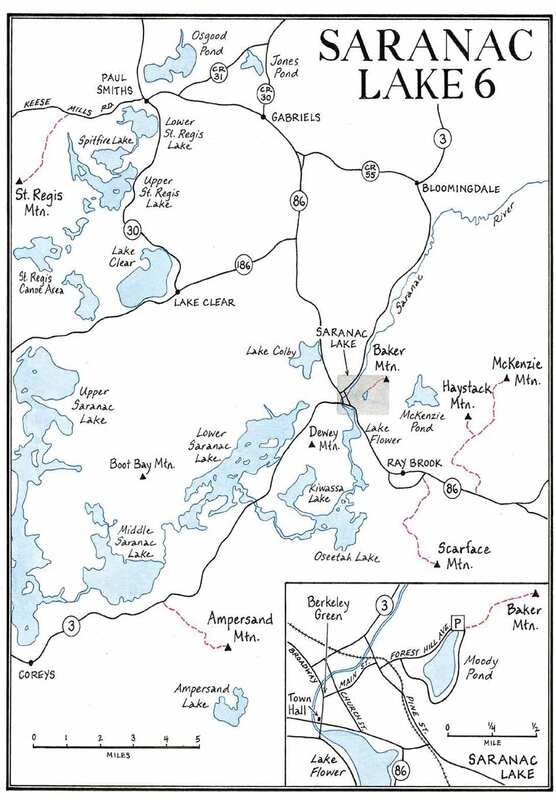 Since May, 179 hikers had become Saranac Lake 6ers as of mid-August. Twenty-seven of these are Ultra 6ers, having climbed all six peaks in less than twenty-four hours. the village’s leaflet in town hall or in the region’s motels and hotels. More information can be found at www.SaranacLake6er.com. Following are descriptions of the Saranac Lake 6, in order from smallest to tallest. Baker is the easiest and most frequently climbed of the Saranac Lake 6. On a nice summer day, you likely will run into locals getting a workout and tourists looking for a big view. The hike begins across the road from Moody Pond on the outskirts of the village. 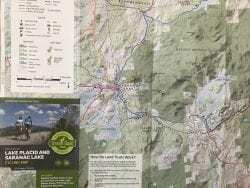 The trail climbs nine hundred feet over 0.9 miles. A hundred yards past the register, the trail forks. Either way will get you to the top, but bear right to follow the official route, marked by red disks. You can descend by the other trail to make a loop. As you climb, you may see a number of side trails. It seems that every inch of Baker has been trod by someone. The red disks are few and far between, but if you stick to the well-beaten path and keep ascending, you should be OK.
About a third of the way up, the trail levels for a spell, then steepens again after surmounting a short rock wall. The forest changes from hardwoods to evergreens. Nearing the summit, you traverse bedrock slabs with views of mountains, lakes, and, directly below, the village of Saranac Lake. Those with young children will want to keep an eye on them while on the slabs. The actual summit is a hump of bedrock topped by a geodetic survey disk. Nearby is a ledge with superb views of the High Peaks in the distance. Much closer, you can see three of the other Saranac Lake 6: McKenzie, Haystack, and Scarface. (You also can see Ampersand from the aforementioned slabs.) Look for a short path that leads to a hidden ledge with a view of the Saranac River valley. For the return trip, you can retrace your footsteps, but if you want to do a loop, cross over the summit hump and follow an obvious trail down. It’s unmarked and steep in places. About halfway down, as the grade eases, you may notice a path to the right. It leads to cliffs frequented by rock climbers. Bear left to return to your starting point. DIRECTIONS: From Pine Street in Saranac Lake, turn onto Forest Hill Avenue and drive to the north side of Moody Pond. Park across from trailhead. St. Regis Mountain is a bit farther from downtown Saranac Lake (14.6 miles) than the other 6ers, but the enjoyment-to-drive-time ratio is favorable. This is a family-friendly hike with a spectacular payoff in views from the top. The summit overlooks the waters of the St. Regis Canoe Area, the High Peaks to the south, and the lower, northern reaches of the Park. It has been largely open since Verplanck Colvin and his survey crew immolated the mountaintop in 1876 when a brush fire got away from them. Now the summit is a rounded vantage point of rock outcroppings, low trees, ferns, feathery grasses, and reflective rain pools. A closed and abandoned fire tower, its lower stairway removed for safety, watches over the realm. To attain this reward, the hiker must simply navigate 3.0 miles of trail through a pleasant hardwood forest on a route whose difficulty ranges from easy to moderately steep. The main consideration for parents or trip leaders deciding whether the trip is appropriate for the less-intrepid members of their excursion is whether they can enjoy a 6.0-mile round-trip. There are no scary obstacles like ledges to clamber up or difficult stream crossings. On a Saturday this summer, the trail was busy with groups that included infants in backpacks, preteens, teens, and all manner of dogs. The assemblage seemed well pleased. The trail begins on a dirt road that leads to the privately owned Topridge Estate but within five hundred feet turns off to the right and away from private lands. The first half of the route covers gentle terrain, first ascending to a ridgeline, then descending gently before climbing again to where a small footbridge crosses a stream two miles in. A steady but unhurried hiker can reach this point in an hour and enjoy the musical water while taking a quick break. From here, the trail climbs more seriously but is seldom more than moderately steep. As you approach the summit a path to the right leads to an overlook bordered by blueberries. 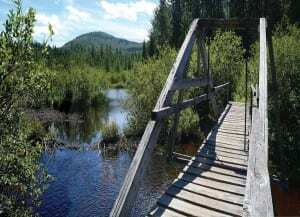 Climbing to the summit, you first get a glimpse of the fire tower rising beyond outcroppings, then the view opens up at your feet, a panorama of lakes and ponds in the foreground, with blue mountain ranges layered in the distance. DIRECTIONS: From NY 30 in Paul Smiths, turn onto Keese Mills Road and go 2.4 miles to a lot on the left. The first two-plus miles of the trail to Haystack Mountain offer a relaxing and flat walk through a classic hardwood forest. The real climb occurs in the last mile. Although moderately challenging (perhaps too challenging for young children), the hike to the summit is worth it for those able. on the summit of Haystack Mountain. The trailhead for Haystack (not to be confused with Mount Haystack, one of the forty-six High Peaks) lies long Route 86 between Saranac Lake and Lake Placid. This also is the trailhead for the route to McKenzie Mountain. 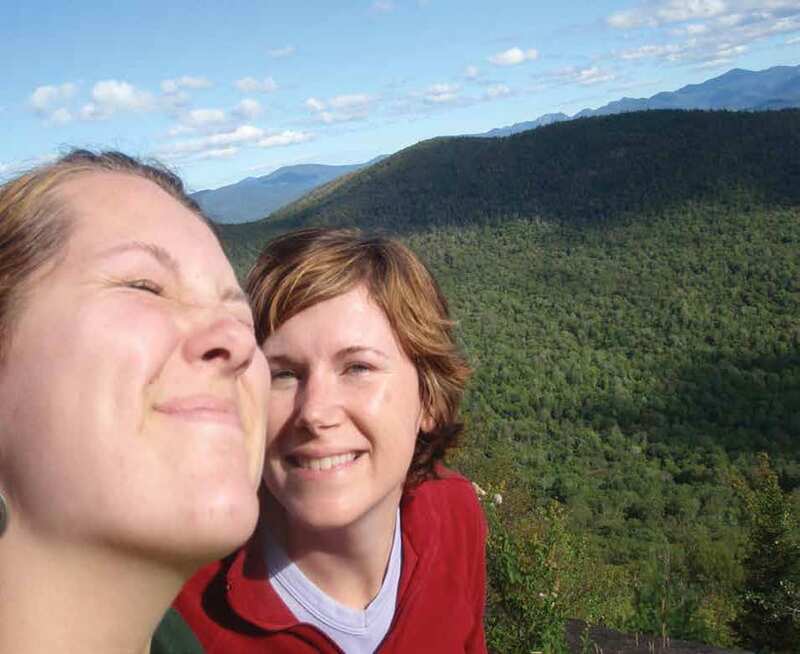 I recently shared a peaceful hike up Haystack with my nineteen-year-old niece, Azaria. Having finished her first year at the State University College of Environmental Science and Forestry in Syracuse, Azaria spent her summer in the Adirondacks to experience firsthand some of what she learned in the classroom. As we begin, the pine-needle padding of the forest floor softens our step. Light filters through the trees, beckoning quietly and setting a tranquil tone. After hiking a mile or so over gentle terrain, we cross a shallow brook on well-placed boulders and bump into Explorer Editor Phil Brown, who was returning from McKenzie Mountain. After a brief dendrology lesson, Phil remarks, “Be sure to stay to the left at the split” (where the trail to McKenzie diverges). We thank him for the tip and head on our way. Shortly afterward, we come to an old stone foundation with a crumbling wall, where we stop to rest and take photos. Beyond this, we climb gently beside Little Ray Brook. The timpani of falling water is a pleasing accompaniment to the ascent. In a few minutes, at 2.4 miles, we reach the split that Phil had mentioned. We share a good chuckle as the trail marker is large, legible, and easily seen. Not even I could have missed it. I’ll try not to see this as a measurement of Phil’s estimation of my navigation skills. Bearing left, we soon cross the brook at a concrete spillway and then begin the real climb. We find ourselves surprised by the increasing steepness, but we get our first reward when we reach a lookout at 3.2 miles. In another tenth of a mile, we reach the summit. As this is my first climb up Haystack, I am pleased that the vista lives up to its reputation. We sit down for a picnic and enjoy the generous bird’s-eye view of the High Peaks and some excellent cloud-spotting. 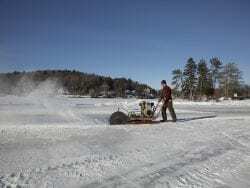 DIRECTIONS: Park in a large pull-off on the north side of NY 86 between Lake Placid and Saranac Lake. It’s about five miles from Saranac Lake. While the views from the summit of Scarface Mountain are not as good as those from the other 6er peaks, the trail itself is a lovely ramble, making the hike worth the effort. The trail starts off relatively flat for the first two miles and winds through majestic stands of red and white pine. The sixty-foot-plus canopy gives this section a sun-dappled, cavernous feel. Not far from the trailhead on Ray Brook Road, you cross railroad tracks used daily by the Adirondack Scenic Railroad from May to October. You should hear the train whistle long before the train approaches, but always take care crossing the tracks with dogs and small children. on a wooden bridge built by state prisoners. After a half-mile, the trail crosses Ray Brook on a wooden bridge built in 1985 by the inmates of a now-closed state prison in Gabriels. From the bridge, you have a nice view of the northeastern summit. Incidentally, there are two other prisons located off Ray Brook Road, one state and one federal. It is not unusual to be startled by the sounds of target practice from time to time. In two miles or so the trail jogs to the left, marked by a sign, and parallels a brook. After crossing the stream, the trail begins to steepen. Here the conifers give way to a more dense forest of maple and other hardwoods. Mushrooms of every size and color and a variety of mosses can be seen along the path. Large glacial erratics dot the woods. Farther up, the trail climbs abruptly on a staircase of well-placed rock that dead-ends at the base of an almost-vertical slab. It looks daunting, but sturdy tree roots provide excellent handholds. The right side of the slab is the best way to go as it leads you to where the trail resumes. After a bit more of steep climbing, the trail eases and takes you to rock ledges at 3.2 miles with views to the south, west, and north. You can see many peaks, including the wild Sawtooth Range, as well as Oseetah Lake and the Saranac Lakes chain. The official trail continues another four tenths of a mile to a lesser view, now obscured by vegetation. From here, a herd path leads another four-tenths of a mile to Scarface’s forested summit. DIRECTIONS: In Ray Brook, turn onto Ray Brook Road from NY 86 and go 0.1 miles to lot on left. Ampersand has the most spectacular view of the Saranac Lake 6. Despite its steepness, it is one of the most popular mountains in the region. Almost immediately after signing the register, you come to a log bridge that crosses a small brook. Over the next mile or so, the trail remains relatively flat and wide. Sunlight filtering through stands of towering hemlock and white birch gives the feeling of being in a cathedral along this mossy section. At about a mile, you cross a wetland on a long plank bridge called a puncheon. Just past this, the trail crosses another stream and then begins to climb fairly abruptly. Large rocks have been placed by trail crews to create a staircase of sorts. Prepare yourself for a good quad-burning climb. In places ascending can be a bit of a scramble up loose rock and over tree roots. At 1.9 miles the grade steepens and takes on the appearance of a rock slide. Take special care here, especially when the trail is wet. At 2.1 miles you come to an overhang of rock on your right. Just past this the trail finally levels off and continues through dense spruce. The path descends a bit and then rises before you come to the headwall of the summit. The final approach requires hoisting oneself up four feet or so through a gap in the rock. If you have a canine companion, you may have to offer assistance. Once you’re through, the large dome of summit rock awaits. Follow the yellow blazes painted on the bedrock to the summit marker. Often there are large pools of rainwater where a hot dog can cool off. 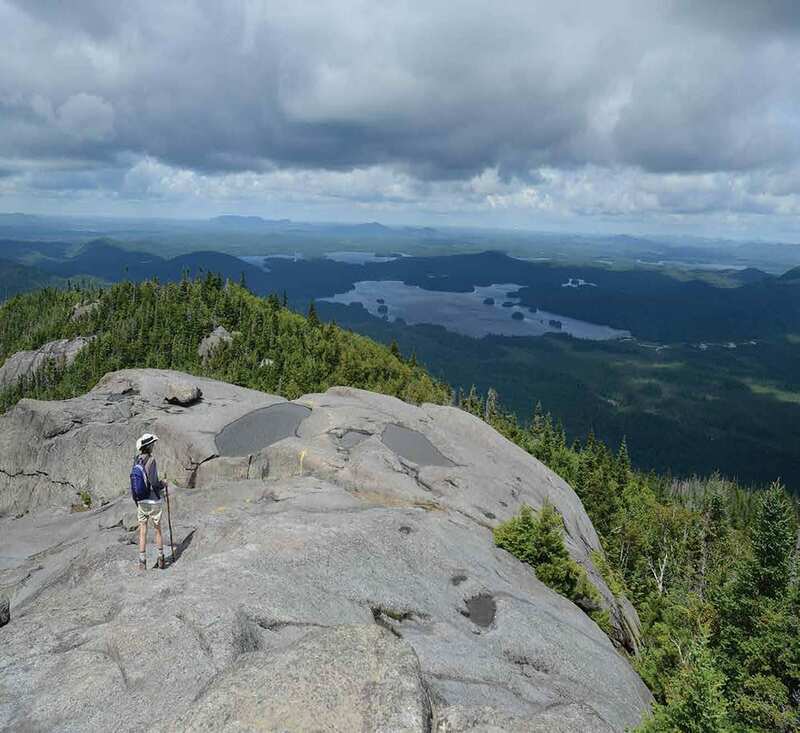 The summit rewards the hiker with spectacular views of the Saranac Lakes to the north and northwest, Whiteface and McKenzie mountains to the northeast, and Ampersand Lake and the Seward Range to the south. 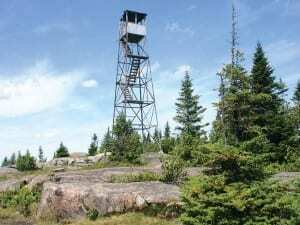 At one time there was a fire tower on the summit. Today you’ll find a plaque dedicated to one of the early observers, Walter Rice. Ampersand was the first mountain ever climbed by famed Adirondack adventurer Bob Marshall in 1915, at the tender age of fourteen. Standing on the summit, it is not hard to see how Marshall might have been inspired to climb the forty-six High Peaks and eventually mountains all over the country. DIRECTIONS: From town hall in Saranac Lake, drive west on NY 3 for 8.1 miles to a lot on the right. McKenzie Mountain falls just short of the fourthousand-foot benchmark that would qualify it as a High Peak. In fact, it actually is higher than Couchsachraga, one of the official forty-six High Peaks (which modern surveys found to be 3,820 feet). McKenzie is not for young children or inexperienced hikers. Getting to the summit from the Route 86 parking area entails a round-trip of 10.6 miles with more than 2,200 feet of elevation gain. For the first 2.4 miles, you follow the trail to Haystack Mountain to a fork. Bear right to go to McKenzie, following red markers. At 3.6 miles, you reach the junction with the Jackrabbit Ski Trail. To this point, all the climbing has been gentle. That is about to change. Over the final 1.7 miles, the trail climbs about 1,400 feet. It steepens soon after crossing the Jackrabbit, gaining a thousand feet in just half a mile. This section is often muddy and eroded right down to the bedrock. At 4.3 miles, you reach a lookout on the right with fabulous views of the High Peaks as well as three other Saranac Lake 6ers—Haystack, Scarface, and Ampersand. Beyond here, the going is much easier as you pass through a beautiful subalpine forest of balsam, spruce, and white birch, prettified with ferns, moss, and wildflowers. En route to the top you’ll pass over a few false summits, which means some ups and downs. On one of these, look for a spur trail to the right that leads to a lookout over Lake Placid toward some of the High Peaks. On another false summit, there is a ledge just to the left of the trail with great views to the west. This ledge also offers a clear view of McKenzie’s true summit just ahead. As soon as you reach the real summit, you’ll see a short path on the left that leads to a large ledge with views to the south, north, and west. From here you can see countless peaks, including all of the other five 6ers. This is an ideal place to have lunch. After returning to the main trail, go left and walk ten yards or so to a path on the right that leads to a view over Lake Placid that takes in many of the High Peaks, including nearby Whiteface Mountain. You can shorten the McKenzie round-trip to 7.2 miles by starting at Whiteface Inn Road and going up the Jackrabbit to the aforementioned junction. DIRECTIONS: Same as for Haystack Mountain.